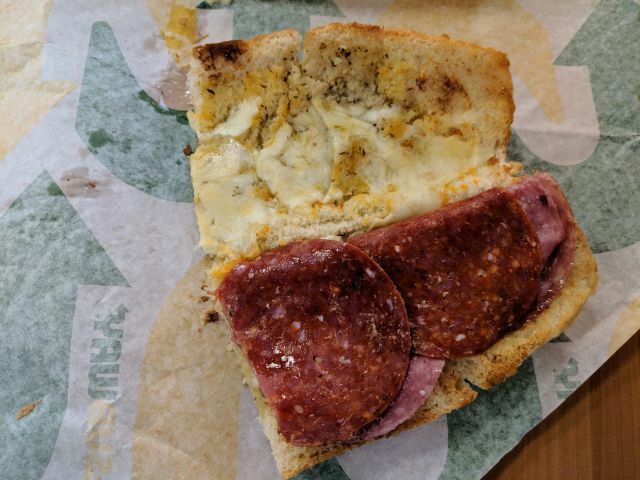 Subway's Ultimate Spicy Italian sub features their new cheesy garlic bread (their regular bread toasted with garlic butter and mozzarella cheese) filled with pepperoni and Genoa salami and sprinkled with parmesan. I bought a Footlong for $7.99 (a 6-inch was $5.39). 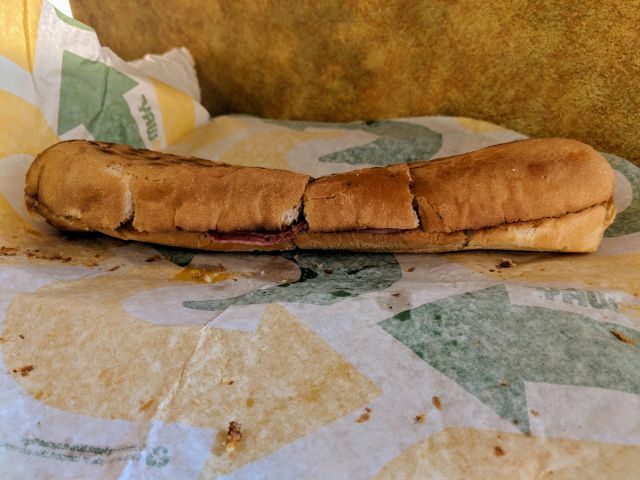 Without the veggies, my sub came out rather flat. I thought the bread would be a bit spongier with more volume but I guess not. It's not as if the sandwich maker pressed it down or anything either. They put a good amount of garlic butter and a lesser amount of mozzarella onto both halves of the bread before toasting. The result was an enjoyable and very garlicky garlic bread that wasn't super cheesy but was cheesy enough. The crumb of the bread sopped up a good deal of the spread so that there was an even amount of flavor throughout. 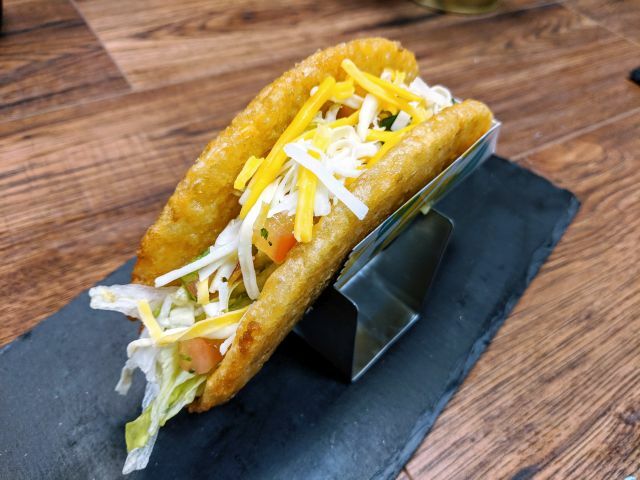 The crust offered an almost delicate crunch. The meats came across rather well with pretty of salt and a just bit of spicy heat from the pepperoni. 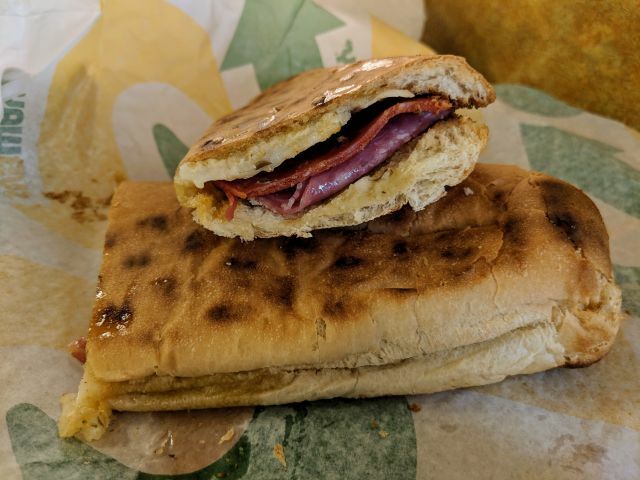 When it comes down to it, the Ultimate Spicy Italian Sub is probably the best thing I've gotten from Subway in the last two years or so (although maybe not the prettiest). I love me some garlic bread and Subway did it well here. I would like a little more cheese though.